What an exciting week! The races for all of the mentionable spots in the Newsletter were up for grabs, right down to the wire and we've got ourselves a pretty good race through the first month of the year. 7 points was the name of the game in the Player of the Week honours and we had five players tied for the top spot in Week Four and they were all skaters. Thankfully, the first tie-breaker, goals scored, narrowed it down to our Player of the Week quite quickly, but it was really close here this week. Anders Lee of the Islanders, Mikko Rantanen of the Avalanche, Ryan O'Reilly of the Blues and Mark Scheifele of the Jets all came up short on goals scored this week, as Sidney Crosby of the Penguins finished with 5 goals and 2 assists to take top spot in Week Four. The Pittsburgh Penguins were on the road out west through Week Four and it proved to be a very fruitful trip for their captain. A pair of goals against the Oilers on Tuesday, a goal and a pair of assists against the Flames on Thursday and then another pair of goals against the Canucks on Saturday night really rounded out his week. This brings Crosby's totals up to 5 goals and 12 points in the first nine games of the season, which is currently good enough for 36th overall in hockey pool scoring through the week. In the hockey pool, Eric made the Penguins captain into his top pick, taking him 10th overall, which may not have the value quite yet, but it is a long season and Crosby's consistency is one of the things that truly makes him one of the best players in the league. Four teams hit the 30-point plateau in Week Four and it was a pretty good race, a lot of jockeying for position through the final few days of the week, but Stacey C.'s team was the one that stood out the most, when it was all said and done, finishing with 37 points and moving up the standings from 16th place to 6th place in the process. That's some solid moving and shaking! 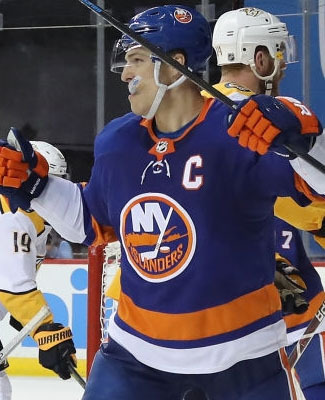 Stacey's team had one of the candidates for Player of the Week on his side, but Anders Lee of the Islanders didn't quite have the goal-scoring pedigree through the week, but he has been quite the leader for Long Island already this year, now donning the captaincy for the team, leading with 7 points. Logan Couture of the Sharks and Leon Draisaitl of the Oilers were also among his top scorers, each finishing with 5 points in the week, while Zach Werenski of the Blue Jackets and Petr Mrazek of the Hurricanes each finished with 4 points each. There were still two players on his side that were unable to pick up points in the week, but for the most part, his team has remained healthy, tied for 4th in skater games played and 6th in minutes played by his goalies, so his team is staying in the race by getting into the game. The big week now sees his team at 98 points, only 6 points back of 1st place and 4 points back of 3rd place, so it is right in the thick of the good race. Historically speaking, this is Stacey's 7th mention in the Mover & Shaker nod on the Newsletter, his first since Week Fifteen of the 2017 season, where his team finished 7th overall that year. The Basement Dweller nod was contested quite poorly as well in the week, as it came down to the wire for a few teams as well. Scott's team, however, mired with a long-term injury and a long-term suspension already, also found itself with a bunch of cold streaks at every position, it would have seemed, seeing his team finish with 15 points and it fell to 25th overall in the standings. Vince Dunn of the Blues was his team's only bright spot in the week, finishing with 4 points, but there were seven players, half of his team, without any points in the week and that ultimately led to the downfall of the week. Other than the injury and the suspension, it was just cold streaks that were keeping his team down, as those two mentions are the only two on the injury/news webpage today, even before the weekly reset, which will be coming up this afternoon. This is Scott's first mention in the Basement since his disastrous 2012 season, when he made six appearances and finished 20th out of 22 teams that year. To his credit, he has really tightened his hockey pool strategy up and it was some pretty awful luck to see him back down at the bottom of the weekly standings this week. We almost had a completely brand new top three teams in the money ranks this week, but Neil's team stuck around to sit in 3rd place, but otherwise it is completely brand new. Our new leader is Steve, who jumped up from 5th place to take on top spot with 104 points, thanks to a 34-point week and Brian also had a 34-point week to snuggle up right behind him at 103 points. Neil's team sits at 102 points and Benson's team is 4th this week, now at 100 points. 14 points now separates 1st place all the way down to 12th place, which means a great week by any one team in that range right now could find their way up to top spot in a big hurry. This is certainly where we want the race to be, but maybe more so, if this was to happen in the latter weeks of the season. It wasn't necessarily a great week for the rookies in Week Four, as the pool only collected 11 points in total from the freshmen. Three teams each finished with a pair of points, John P., Jesse and Brian's team had those teams that did so, but they really could shave off much of the lead that Clayton's team roared out to, which now stands at 8 points, as his team did collect a single point to bring this total up to 15. Sadly, I haven't been keeping track of the weekly shootout attempts that the pool has been taking, because that would probably be a much better statistic to look at, when there were only 3 goals scored in the week in another week where games were being decided in regulation or overtime. What's up with that? Four teams currently lead this mini-game with 2 shootout goals each: Jeremy, Ryan, Neil and Troy have those markers to their name. Both Jeremy and Ryan's team are 100% in the shootout, so far this year, while Troy's team has already posted seven attempts in total. There are still three teams in the pool that haven't seen a shooter yet (Brenda & Seward, Chelsea and Scott), while Clayton's team has taken the most shots without a goal (4). We did see a new season-high in game-winning goals collected by the hockey pool this week, as the collective managed to snag 37 winners in Week Four. Four teams finished with 3 winners each to take the weekly mention: Benson, Jesse, Kristy & Don and Brian get the nod. Benson's team still holds the overall lead, with 9 game-winners, just a single tally better than John P.'s team. The goon team of the week belongs to our new pool leader, Steve, as his team was good for 30 minutes in penalties in Week Four, really out there earning those valuable minutes. Stacey C.'s team, our Mover & Shaker, is our new overall leader, now with 77 minutes in penalties, but this race is also quite close, as there are four teams within a major penalty of Stacey. Three teams saw elimination in the goalie survivor pool in Week Four, as John P., Scott and Kristy & Don's teams were all unable to post wins in the week. This now leaves us with 12 teams still in the race, less than half of the pool now, only four weeks of the season into it. Of the teams that remain, Wes and Mike lead those teams with 9 wins, to now be considered the favourites for the title. Week Four was the busiest week-to-date in the NHL, with 47 games on the schedule, which meant there were plenty of opportunities for points in the week. With those opportunities, we did see a new season-high in weekly scoring, to no surprise, finishing the week with 624 points, which meant an average of 13.28 points per NHL game in the week. Participation numbers still took a bit of a hit, if only marginally, and the coaching styles are really starting to show, limiting the number of goals scored in each game. This coming week, there are only 45 NHL games on tap, including a couple of games overseas, which does have an effect on the schedule. Hopefully, we get a few of those players back from injury and we can really start to see points go up on the board in a regular fashion. The Edmonton Oilers have some decisions to make on their roster for the rest of the season and with back-to-back healthy scratches for rookie defenseman Evan Bouchard, his status for the rest of the season is certainly up in the air. The 19-year old has only suited up for seven games this year, still a couple of games left before the Oilers truly have to decide whether or not to burn a year on his entry-level deal and keep him around, but if these scratches over the weekend may suggest, they could send him back to junior before too long. There were a number of Oilers that were looking solid in the preseason and Bouchard was definitely one of them, getting Brenda & Seward to pick him with their 11th round pick this year. If he gets sent down, they'll have a spot on their blueline that won't be worth anything until Week Ten. The Vancouver Canucks updated the status of defenseman Alex Edler, as they now expect him to miss the next 3-to-6 weeks with a knee sprain, suffered in Week Four. Edler's absence will leave a pretty big hole in the Canucks' lineup, with 5 assists in the first 10 games of the year, so far. That should take his availability out through the Week Nine Waiver Draft, which will leave quite the decision for Jeremy and his team, which has a pretty solid defense, tied for 5th in scoring in the pool with 21 points.